Do you feel that there just aren't enough hours in a day? Could you use a little relaxation, without sacrificing productivity? Would you like to feel more "real"? If you've answered yes to any of these questions, you'll find the solution in the art of meditation. 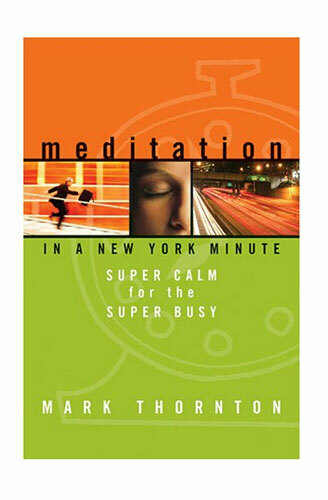 And the best part, says executive meditation coach Mark Thornton: you can do it "in a New York minute." In Meditation in a New York Minute, Thornton demystifies meditation and makes it accessible to all, as he presents his complete program of quick and effective meditation tools, including nineteen powerful techniques from the world's wisdom traditions distilled into "micro-doses" you can use between business meetings, while commuting, in the shower - whenever you have a free moment..
"Meditation is a journey to the ocean of calm. As you read these words, you can slip into the ocean of calm at any time. An amazing truth about the ocean of calm, deep inside yourself, is that it has many different layers. As you sink deeper into the calm, you come across layers of love, bliss, compassion, joy, delight, and a range of other fragrances and textures. Deep beneath all of these lies your heart. "What is your heart? How do we get there? Why would we really want to do this? "I'm not referring to your physical heart, which pumps blood throughout your body. Nor to the center of your chest, which some traditions refer to as a center of energy called the heart chakra. Nor to 'heart' in the Buddhist sense, which is located in the mind. All of the above are just doorways into a deeper part of you. Your heart, as in the phrase 'the heart of the matter,' is your essence, your center, your core. The footprints of God are seen. The heartbeat of the universe is felt. The fragrance of love can be smelled. The sweetness of compassion can be tasted. The texture of what is eternal can be touched. The endless journey into yourself begins.